YouTube for dance videos DanceJam has launched into open beta today after several months of private testing. 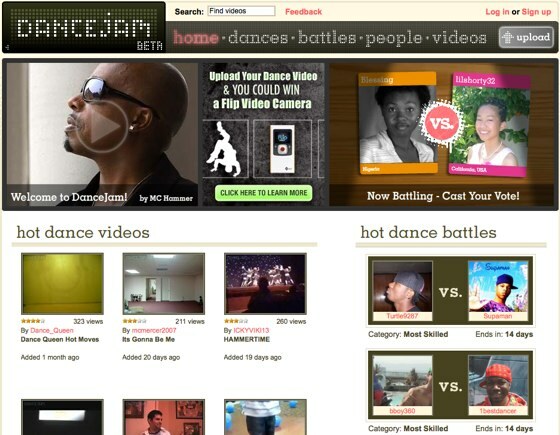 DanceJam offers dance battles where users dance off against each other, with viewers voting on the best video. DanceJam also offers general dance videos, including locally uploaded content and videos from external sites such YouTube. DanceJam was founded by M.C. Hammer, and Geoffrey Arone and Anthony Young from Flock. The company has taken $4.5 million in funding over two rounds, with investors including Ron Conway, Alex Algard, Michael Tanne, Geoff Ralston, Alex Welch, Ariel Poler, Rustic Canyon Partners, Softbank Capital and Michael Arrington. You can see an example of a “Dance Jam” here. Disclosure: Michael (as noted in the post) is an investor, I’m not.